Announces Edsel B. Ford II as Honorary Chairperson. 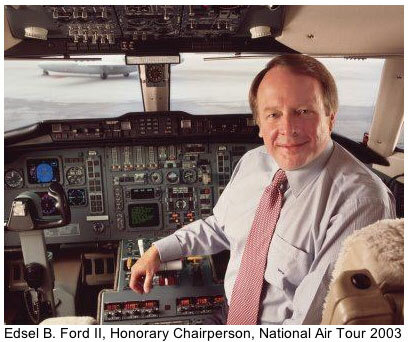 MINNEAPOLIS (July 7, 2003)  The National Air Tour 2003, the historic flight re-creation of the National Air Tours that took place from 1925 through 1931, today announced that Edsel B. Ford II will act as honorary chairperson for the 2003 Tour. Just as his grandfather Edsel B. Ford did for the original Tours, Edsel B. Ford II will flag-off the start of the Tour when it departs the Dearborn, Mich. area on Sept. 8, and present the trophies to participants at the completion. Weather permitting, more than 25 rare, vintage aircraft, including at least three Ford Tri-motors, will fly approximately 4,000 miles during a 17-day period. The Tour will bring living aviation history to people in 26 cities, through the media and over the Internet at www.NationalAirTour.org. The Tour is expected to return to Dearborn on Sept. 24. Officially known in 1927 as the National Air Tour, the Tour was commonly referred to as the Ford Air Tour. Edsel B. Ford, a staunch supporter, provided the elegant trophy and Ford Motor Company provided financial support. Ford dealers along the various Air Tour routes often sponsored the Tour stops. Edsel and Henry Ford contributed greatly toward the development of civil aviation by supporting ventures such as the National Air Tours, the development of radio navigation, terminals, hangars and other airport infrastructure, as well as all-metal transport aircraft. In fact, it was Ford Motor Company that perfected the use of radio navigation in aircraft and built the first concrete runway in the world at Ford Airport in Dearborn. While it was the Wright brothers who discovered powered flight, it was Edsel and Henry Ford who helped the nation realize the potential of aviation. Edsel B. Ford II continues the Ford connection to aviation today with his ownership of Pentastar Aviation, a Pontiac, Mich.-based full-service aviation services provider. The original National Air Tours helped build Americas modern system of air transportation by showcasing the latest advancements in aircraft design, encouraging the development of airports and promoting the safety and reliability of civil aviation. The original National Air Tours visited more than 110 cities in their seven-year history. The cities often prepared for the Tours arrival by improving their airports and in some cases, building a new landing field. In addition to Edsel B. Ford IIs support of the National Air Tour 2003, Ford Motor Company is celebrating the 100th anniversary of flight through its presenting sponsorship of EAAs Countdown to Kitty Hawk  a centennial celebration of the Wright brothers first powered flight, an innovation that forever changed our world. Led by EAA, presented by Ford Motor Company and supported by Microsoft Flight Simulator and Eclipse Aviation, this yearlong series of inspirational events honors the innovation and determination it takes to make world-changing dreams a reality. Countdown to Kitty Hawk features an interactive touring pavilion and the worlds most-accurate 1903 Wright Flyer reproduction that will exclusively re-enact the Wright brothers first flight at Kitty Hawk, N.C., on Dec. 17, 2003  exactly 100 years later.